NAIROBI, Sept 1 (Reuters) - Kenya's Supreme Court nullified President Uhuru Kenyatta's election win citing irregularities on Friday and ordered a new poll within 60 days after last month's voting was followed by protests and sporadic violence that killed at least 28 people. East Africa's biggest economy has a history of disputed elections. A row over the 2007 poll, which Odinga challenged after being declared loser, was followed by weeks of ethnic bloodshed in which more than 1,200 people were killed. 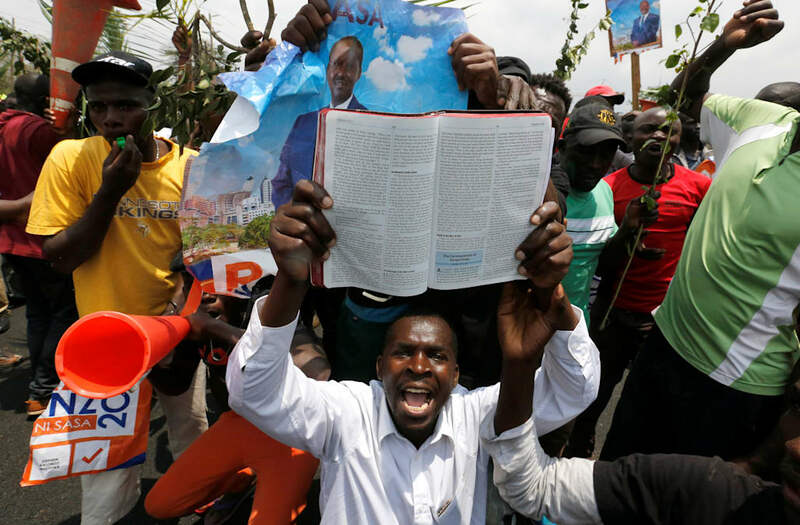 Friday's ruling, which sent shares plummeting on the Nairobi bourse, brought celebrating Odinga supporters onto the streets of his western heartland. In court, a grinning Odinga pumped his fist in the air as his supporters cheered and shook his hand. "The declaration (of Kenyatta's win) is invalid, null and void," said Judge David Maranga, announcing a verdict backed by four of the six judges. He said the election board "failed, neglected or refused to conduct the presidential election in a manner consistent with the dictates of the constitution." Official results had given Kenyatta 54.3 percent of the vote, compared to Odinga's 44.7 percent, a lead of 1.4 million votes. Kenyatta's ruling party also swept the legislature. "This indeed is a very historic day for the people of Kenya," Odinga said after the decision. "For the first time in history of African democratization a ruling has been made by a court nullifying irregular elections for the president." International observers had said they saw no sign of manipulation of voting and tallying at polling stations. Civil society groups said the election board was too slow posting results from polling stations. Thousands were missing when official results were declared, so opponents could not check totals. Court experts said some documents lacked official stamps or had figures that did not match official tallies. At least 28 people were killed in violence after Kenyatta was initially declared victor. Most were shot or beaten to death by police amid scattered protests in opposition strongholds. Ethnic loyalties still tend to trump policy in Kenyan votes. Kenyatta is a Kikuyu, the biggest of Kenya's more than 40 ethnic groups, while Odinga is a Luo, another big ethnic group. A lawyer for Kenyatta, Ahmednasir Abdullahi, said the decision was "very political" and the election board had "done nothing wrong." But he said the decision had to be respected. "Let's go back to the people and the Kenyan people will express themselves again," he said. Many voters in the west of Kenya, Odinga's stronghold, and along the coast, where many of the nation's Muslims live and traditionally another region of opposition support, feel neglected by the central government. Kenyatta's main support base is in the central region. Kenyatta and Odinga are both scions of political families. Kenyatta's father, Jomo Kenyatta, was the nation's founding president who had a long running rivalry with Oginga Odinga, who failed like his son in efforts to secure the top job. Residents in the western city of Kisumu, where Odinga has strong backing, cheered and motorcycle drivers hooted their horns. "Today is a special today and I will celebrate until I am worn out,” said 32-year-old Kevin Ouma. "Over 8 million people supported the election of Uhuru Kenyatta but the Supreme Court has ignored this in the ruling which is very shameful," said Matheri Wa Hungu.